As I scuba dive in Oslob Bay off Cebu Island in the Philippines, I see a tiny shadow dart over the surface of the spherical coral block – a minute fish, a goby of the genus Eviota, among the smallest vertebrates in existence, only about a centimeter long and less than 1/10th of a gram light. It’s about a million times smaller than myself, with the same basic vertebrate body: a spinal cord, a bony skull, a brain, kidneys and a liver. With the exception of gills and lungs, the tiny fish and I share similar sets of organs, just at a very dissimilar size. But looking at gobies is not why I came to Oslob. I leave the coral block, and swim towards the shore as the sun darkens – not because of clouds but, rather, a truly gigantic fish swimming directly above me. It’s what I had hoped to see: a whale shark, Rhincodon typus, the largest living fish. Large adults weigh up to 34 tons, more than 300 times my own weight. The difference in weight between the tiny goby and the whale shark is a startling eight orders of magnitude. Some truly gigantic animals populate the Earth. The whale shark, the largest living fish. Photo by the author. These massive disparities in animal sizes have fascinated biologists for more than a century. And there are enormous advantages that come with being large. Big animals have an easier time avoiding predators: some of the tiny gobies have an attrition rate to predation of more than 6 per cent per day (! 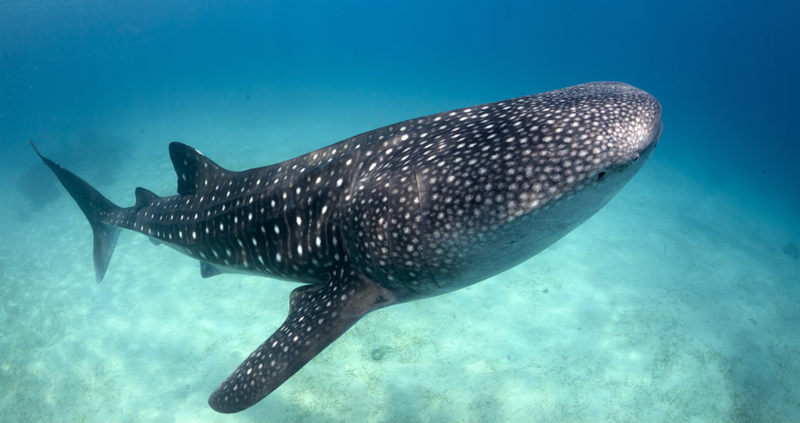 ), while whale sharks live for decades, and are known to have survived tiger shark attacks. Bigger animals can also invest more in reproduction: while a female goby’s body produces only about 250 tiny eggs per lifetime to hatch into larvae, a female whale shark can give birth to a few hundred fully developed shark pups in a lifetime, each more than half a meter in length. And there are more advantages to a big body size: in large warm-blooded animals, maintaining a constant body temperature is easier due to their better surface-to-volume ratio. And in large herbivores, the larger volume of the intestines leads to more effective fermentation processes, which are needed to break down plant material. It pays to be big. 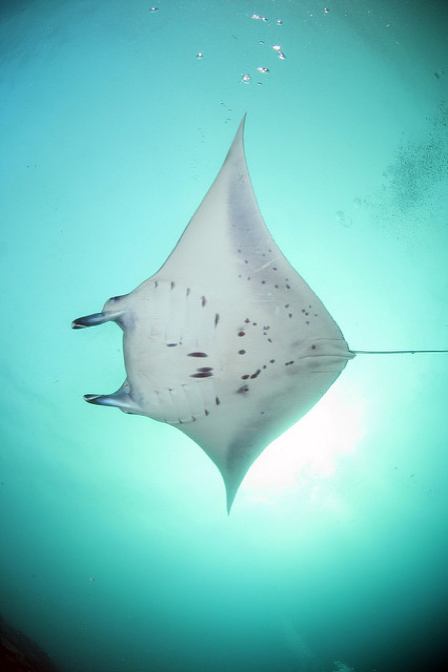 Manta birostris, the manta ray, the world’s largest ray, which can reach wing-spans of up to seven meters. Photo by the author. Indeed, many lineages of animals have vastly increased in size during the course of their evolution. This trend is called Cope’s rule, named after the 19th-century American palaeontologist Edward Drinker Cope. Prominent examples of lineages following Cope’s rule are dinosaurs, which originated from an already sizeable two-meter-long reptile alive in the mid-Triassic (231 million years ago). During the following 165 million years, dinosaurs evolved into the largest land animals ever, the Titanosaurs (up to 37 meters long), and the largest land predator ever, the mighty Tyrannosaurus rex. Another striking example are the cetaceans, the whales and dolphins. These secondary marine mammals descended from a cat-sized amphibious omnivore roaming around India 48 million years ago called Indohyus. When becoming fully aquatic, the cetaceans’ size increased, with the ancient Basilosaurid whales 41 million years ago already up to 25 meters long. The size increase of baleen whales further accelerated during the past 10 million years, and today’s blue whale is the largest animal to ever live, with adults attaining lengths of up to 30 meters and weighing close to 200 tons. Given all these advantages of large body sizes, an obvious question to ask is: why are not all animal species big? One reason is that species of small animals give rise to new species more rapidly. In a recent theoretical study together with Timothy Quimpo at the University of the Philippines, we connected the well-established fact that small animals are more numerous (there are more gobies than whale sharks in the ocean) to the insight that larger populations give rise to new species – a process called speciation – at a faster rate. Hence, some animal species will evolve towards larger body sizes (following Cope’s rule), but the remaining small species will multiply much more rapidly into new small species, and hence keep the majority of animal species small. It is also worth noting that ‘laws’ and ‘rules’ in biology are generally softer than the laws of physics, to which there are no exceptions. Exceptions to Cope’s rule definitely occur, since the advantages conferred by large body sizes are dependent on ecological or anatomical conditions. For example, the early lineages of birds in the Mesozoic did not increase in size; flying is notoriously harder with a bigger body. North American freshwater fishes even decreased in size over the course of evolution, perhaps due to their invasion of smaller bodies of waters. An earlier mass-extinction occurred at the end of the Permian epoch 250 million years ago, and purged a record percentage of animal species on Earth – an estimated 95 per cent of marine species vanished after massive volcanic eruptions radically changed the planet’s atmosphere. The early Triassic, immediately following this mass extinction, was an oddly boring time when it came to biodiversity. Gone were the land-reptiles of the Permian, which had evolved to cow-size, and the continents were mainly populated by Lystrosaurs – dog-sized beaked reptiles. This elimination of large animal species and the survival of small to mid-sized animals is called the ‘Lilliput effect’. Unfortunately, the study of mass extinctions is of more than academic interest these days – we are living in the age of a Homo sapiens-made mass extinction. Since our species left its African roots, we have caused the extinctions of other species, first as hunters, then, after the invention of agriculture, through massive modifications of the environment. And since the onset of the industrial revolution about 200 years ago, we have been changing the composition of the planet’s atmosphere by burning large amounts of fossil fuels. This has led to global climate change, and is further modifying the ecological conditions for countless species. Biologists are still debating if these changes are already as dramatic as those that occurred during the previous big five mass extinctions – they are certainly quite dramatic. To reflect their severity, the name Anthropocene, the human age, has been suggested for the current geological epoch. The megafauna (animals heavier than 25 kilograms) has suffered wherever Homo sapiens went: our prehistoric ancestors likely played key roles in eliminating the giant ground sloths of North America and the horse-sized wombats of Australia. And today, continued hunting and human-caused modification of the environment keep the pressure on, preferentially targeting large animals over small. A particularly dramatic example of this trend is the demise of Steller’s sea cow, a giant relative of the dugong formerly at home in the arctic Atlantic; the sea cow was discovered in 1741, and hunted to extinction within only 27 years. Klaus M Stiefel is an author, neuroscientist and research affiliate with the NeuroLinx Research Institute. He is the author of The Camera and the Brain: What Visual Neuroscience Can Teach the Photographer (2016). He lives in the Philippines.